Michael Pillsbury's "The Hundred-Year-Marathon" is a truly fascinating read with a unique yet powerful idea that'll engage anyone who is even remotely interested in government/politics. Pillsbury, who has held a number of positions in the government that gave him insight into Chinese policy, makes a very convincing case for the theory that China seeks to usurp America's global role in the future. Pillsbury also provides evidence that the US has “made its own bed” in some respects, enabling China to get to this position. Pillsbury not only outlines the situation with China, but writes on what needs to be done to counter China's plan. 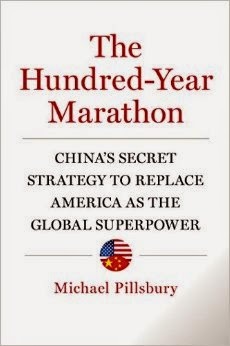 Regardless of your opinion on China-US relations, Pillsbury makes a strong case with great writing that will really make you think. "The Hundred-Year Marathon" website, www.100yearmarathon.com, has some of the declassified photos and documents cited in the book. Worth checking out if you’re curious before you buy. Definitely a recommended read!